The first time someone told me I needed a vision for my business and life I rolled my eyes at them. To me, vision equaled fantasy. What was the point of imagining a pretty picture of the future if I didn’t know how to get there? I didn’t see the value without a map to get from point A to point B. Years later, I realized that my lack of a big, clear vision had been the single largest limiting factor in my life. This article will dig into what a vision is, how to create one, and most importantly, why it’s critical for both your business and your life to have a clear vision. A vision is a detailed visualization of the future. A great example of a vision is the visualization exercise top athletes do before a competition. They run through each aspect of their experience, from start, through execution, to victory. When you create a vision for your business, life, or both, you’ll be doing the same exact thing except you’ll have more variables to consider. There are many techniques for creating a vision, with the most common being a written vision or a vision board. In either case, you’ll want to think and feel into what you want your future, or your company’s future, to look like. You can either write down (or type) your results or create a vision board. A vision board is a graphical presentation of your vision. To make a vision board, grab a large stack of magazines, flip through them, and cut out images and header text that symbolize the different aspects of your vision. Then glue them to a poster board to make a collage. Each method has its pros and cons. Written visions give you the flexibility to write whatever and however you want. A written vision can be short or extremely long, and as formal or casual as you prefer. However, when you’re finished with your written vision, it’s easy to put it in a digital or physical folder and then forget to look at it. A vision board, in contrast, will be somewhat limited by the magazine material you have on hand and the size of your poster board. It is also reliant on symbolism; the images on your board won’t necessarily be exactly what you want, they just symbolize what you want. A vision board is full of pictures of stuff, but shouldn’t be just about stuff. Remember these images are symbols. For example, I put a picture of an African safari on my vision board. While I do indeed want to go on safari, this image symbolizes world travel, not just this specific trip. Unlike a written vision, you can prominently display your vision board in a place you’ll see it throughout the day. If you want to maximize the benefits of your vision, consider doing both a written vision and a vision board. A vision board is a great recurring reminder of the detail in your written vision! Regardless of which approach you take, here are a few things to keep in mind when creating your vision. When you work on conceptualizing your vision for the future, make it the future you want to see happen. One of the reasons you want to have a vision in the first place is that it’s designed to give you a target to aim at. You may as well create a vision for the future that’s awesome! You want to create a vision that pulls you up and forward, not down and backward. This may seem obvious, but it’s surprisingly easy to fall into the trap of limiting your vision. If you’re working on visioning during a time in your business or life when you’re struggling, you may have a bit of negativity or fear crop up and impact your vision. Don’t let this happen. Instead, let your visioning exercise be a fun, positive experience. After all, do you think Michael Jordan envisioned himself missing shots? Or winning championships? I used to tell people I wasn’t an optimist or a pessimist; I was a realist. But my “reality” actually served to confine my vision. Realism is for project plans, not visions. If you know how to achieve absolutely everything in your vision, what good is it? How will it pull you up and forward? Make your vision bigger than what you know how to accomplish today. If the realist part of you rebels, squash it. You’re going to grow and learn over time, so it’s not unrealistic to think bigger than the boundaries of what is possible today. If you feel like parts of your vision are improbable, that’s okay. Put them in there anyway. People used to think running a four-minute mile was impossible, right up until someone did it. Flying was impossible until the Wright brothers came along. Impossible is relative! Putting detail into your vision will be easy and fun if you’re a naturally imaginative, visual person. However, if you’re a bit more left-brained, you may have to work a bit harder at this part. Put the time in; the detail will be worth it. When you create a vision for the future, think about every aspect of your experience, from the perspective of all five senses. Close your eyes and really try to mentally experience your vision. How do you feel when you wake up in the morning? What is the walk into your office like? Where do you live? What is different about your body? Who do you spend time with? What have you accomplished and what are you working on accomplishing? How do you spend your time? What is your house like? Your car? What clothes are you wearing? Which daily rituals do you have? What foods are you eating and how do they taste? Are there any smells that stand out, like your parent’s home cooking? How is your desk set up? Why does having a vision help you accomplish great results? Isn’t all this vision stuff just woo-woo mumbo jumbo? No! If you’re not a believer in The Law of Attraction as presented in The Secret, I don’t blame you for your skepticism. The results of having a vision aren’t dependent on energetic attraction and manifestation. They do have a lot to do with your subconscious, however. Here’s why. The more you think about your detailed vision, the more likely your actions will match up with your intended results. The reason athletes do visualization exercises before a competition is because the mental reps increase the chances their body performs in congruence with their visualization. When Michael Phelps is swimming, it’s unlikely he’s thinking about the exact angle of his knees as he kicks. But his knees are more likely to take an optimal angle if he’s visualized swimming with perfect form. Your brain is a pattern-matching machine. By programming your subconscious with a detailed vision, your brain will match the details to your real-world results. The above point will show up in the way you come across when talking with other people. If you have a vision of yourself as a successful entrepreneur, it’s likely you’ll have more confidence when discussing your business plan. You may stand a little straighter, smile a bit broader, and make more eye contact. These things, in turn, will create different responses from the person you’re talking to. People are perceptive creatures! They will pick up on your confidence and be far more likely to engage with you. Programming your vision into your subconscious stacks the deck in your favor. Why are you more likely to achieve what’s in your vision? As Tony Robbins teaches, there are only two human motivations: the motivation to avoid pain and the motivation to gain pleasure. Without a clear vision, you’re only leveraging one of these motivations. In fact, since you’ll be focused exclusively on moving away from what you don’t want, think about where you’re focusing. You’re focusing on negatives: what you don’t want, what you don’t have, and where you don’t want to be. That’s certainly not optimal for a positive mental state! 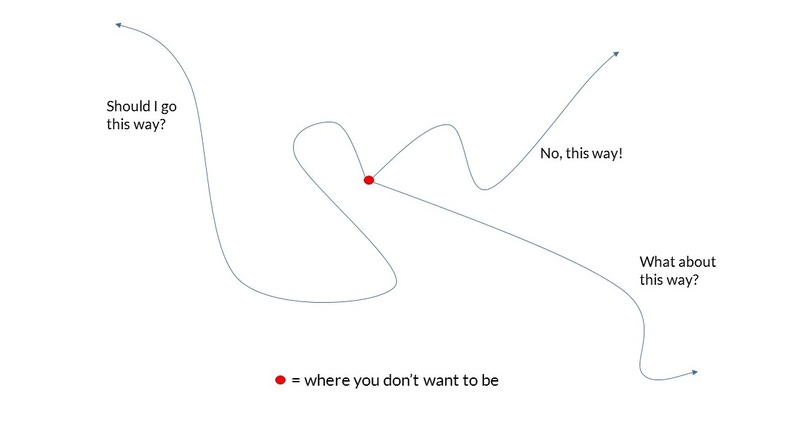 Worse yet, without a vision, you have no north star to guide your path. “Alice in Wonderland” illustrates this point. No matter how confused or complicated things get, you’ll always be able to remember your vision and plot a new course that moves you in the right direction, towards your vision. 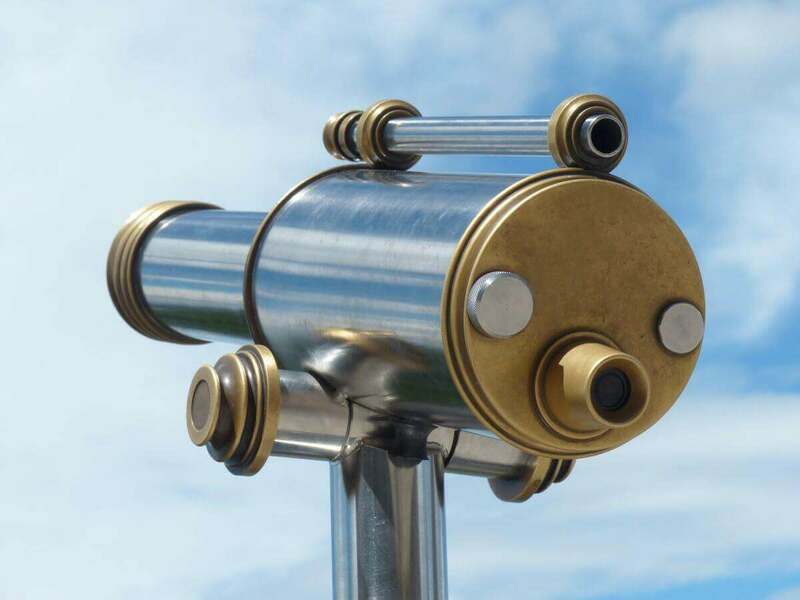 How does having a vision help your business? Creating a vision for your business goes far beyond creating a vision statement. In fact, your company’s vision statement may be summarized version of your larger, more comprehensive vision for your company. The benefits of having a clear vision and the detriments of lacking one are compounded in a business environment. 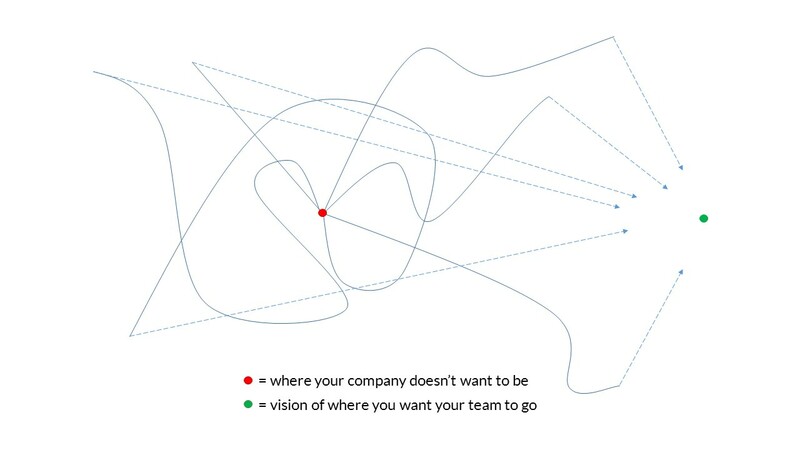 Notice that as your team members start working their way towards your company vision their paths converge. This is how creating and sharing a vision creates team alignment! When everyone is working towards the same end goal they will naturally become closer and closer together. However, much like in the single-person example, nothing is a straight line. Keep the above picture in mind when things in your business get tough. Maybe your vision has gotten a bit lost or confused. Maybe your company started down a path without one. That’s okay. You can create, re-create, and share a vision at any time. 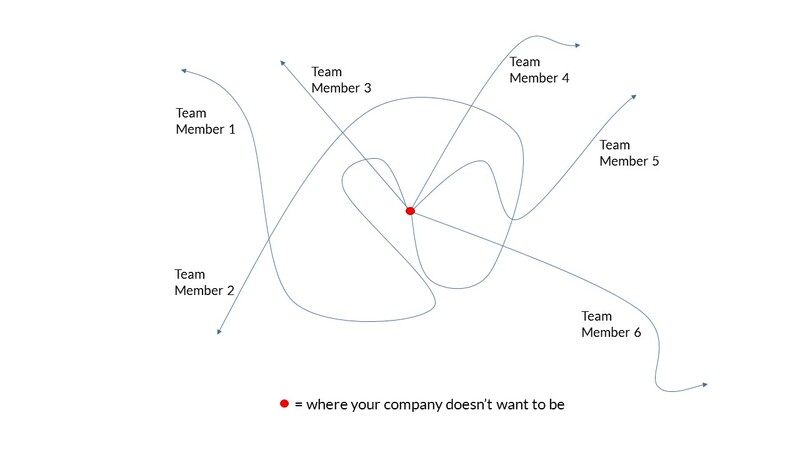 The moment you do, your teams’ paths will start to re-converge. An added benefit of having a company vision is the empowerment it offers your team. When your team members understand where they’re going and why it gives them confidence. They will feel more comfortable making independent decisions and will be more likely to make the correct ones when they have a north star to navigate by. If you haven’t taken the time to create a clear and detailed vision for your life and business you’re effectively navigating without a map. Visioning subconsciously and positively influences your bearing and choices, pulls you forward towards the results you want, helps you and your team navigate when you get confused or lost, and allows for improved decision-making. Whether you write them, vision board them, or both, there is no bad time to create or clarify your personal and business visions.